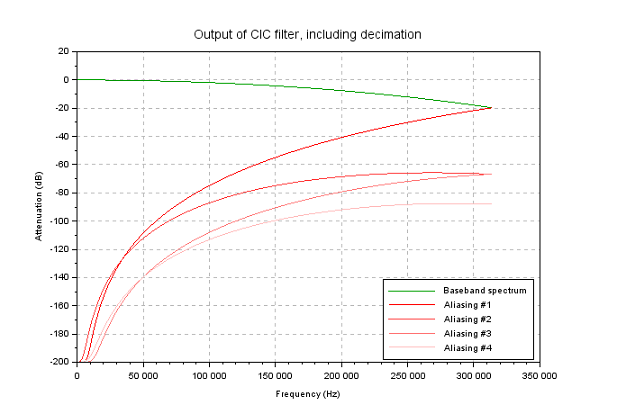 CIC filters are very useful in applications where one needs to change the sampling frequency in a big ratio, for instance for decimation (reduction of the sampling rate: oversampled acquisition systems, sigma-delta ADC) or interpolation (DAC). The advantage of these filters is that they are particularly efficient in terms of complexity (no mulmultiplication, only integrators and comb filters are necessary), which enable them to be used even at very high sampling rate. 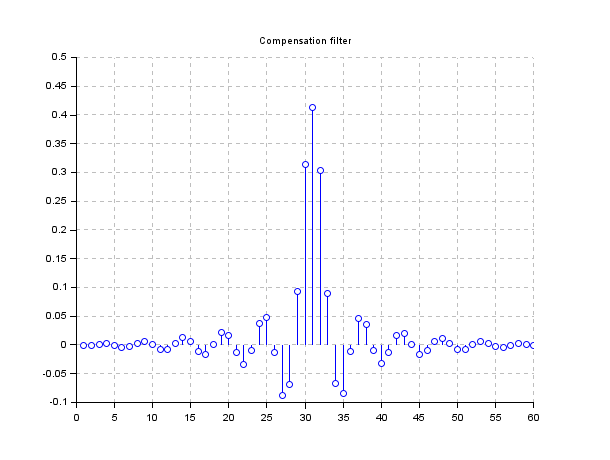 This SCILAB mini-toolbox enables you to evaluate (in terms of frequency response) CIC filters, to design what is called a compensation filter, and to simulate the CIC filtering on real signals. If not already done, install SCILAB (free numerical computing software). Download the CIC design mini-toolbox, and unzip it. Now all the CIC design functions are available on the SCILAB console (see API section for the documentation). 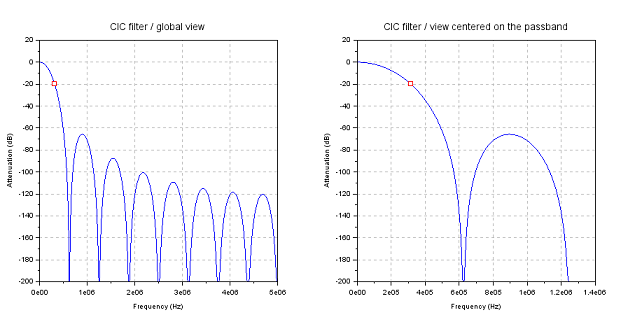 As you can see on the above figure, the compensation filter (red curve), working at 400 Hz, that is, after the decimation by 16 (CIC decimation ratio), show a periodical frequency response (aliasing every 400 Hz), which is normal. The global filter (CIC and compensation FIR) has the desired response. 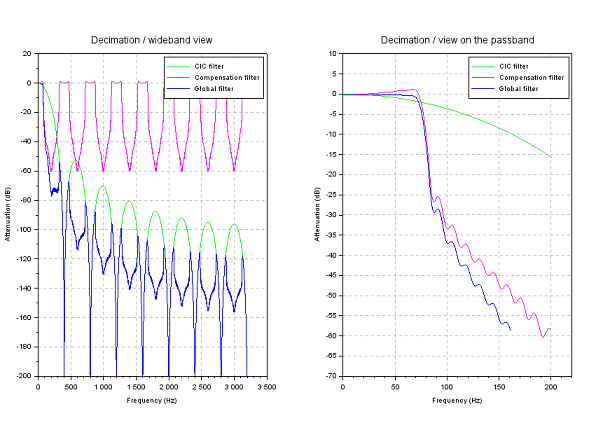 The CIC mini-toolbox enables both CIC decimation and interpolation simulation. 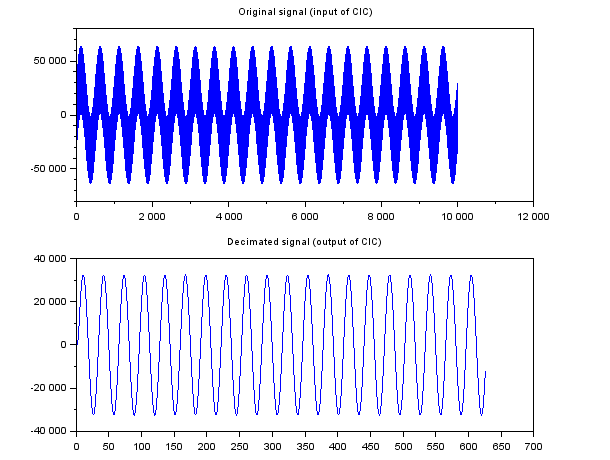 In this example, we simulate the decimation of a signal from the original sampling rate of 10 MHz to a sampling rate of 625 KHz (the complete source code of this example is available in the documentation of the cic_process function).